This band is called the "Road Warriors", for the past six years, the South Texans have traveled 350,000 miles playing more than 1500 shows in 38 of the 50 United States - a relaxing, varying and extremely entertaining country/folk/blues-rock in the luggage. 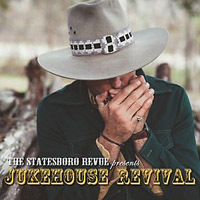 And "Jukehouse Revival" is the current and third disc inside the bag – ready to dance or just to chill with a beer or whiskey at the bar. The beauty of this music is the harmonic structure; vocals and instruments fit together as a unified whole, always connected with a nice touch of nostalgia. The slide guitar softly lubricates through the tunes and a bluesy piano ripples in the background; songwriter and frontman Stewart Mann stands with his high melodious voice right in front of the stage, but incorporated as part of the team, which acts like one piece. This is traditional and handmade Southern rock at its finest. The songs lined up like pearls on a necklace, all from a similar expression but premium design, a smooth ride for the truck on the highway through the prairie amused by a lot of catchy ideas. With the last two songs they take off the foot from the gas and let contemplative end the album. It´s not about to reinvent the avant-garde, the band plays what flows natively through their veins and this simply sounds true and honest.